Following the previous day of Bach, predecessors, and a few successors in the organic realm of pipes large and small, BEMF time-traveled us forward into those overlapping Continental worlds leading up to and encompassing Beethoven at the Boston Museum of Fine Art’s Remis Auditorium on Friday the 16th. Everyone who listens to music, of whatever type, should sit through at least part of a clavichord recital. The instrument is just so extremely quiet, demanding of the stillest attention, that it resets not only the hearing but arguably the soul. On the MFA’s 1796 Schiedmayer clavichord, about the size of a deluxe early-generation boombox, Béatrice Martin soft-served up a large helping of Telemann (1681-1767) and then of his godson C. P. E. Bach (1714-1788), sixth child of J. S.
In her playing Martin partly partakes of the modern ways of inflection and drama emphasis. Telemann’s Fantasy IX in B Minor, Concerto in G Minor, and the opening Allegro of Fantasy X in D Major, while not too swoony, did regularly exhibit minor speedup and slowdown, where sometimes the pauses are sufficient to make the music and the performance both feel tentative. Thus sectional, the music becomes sort of the opposite of attacca. Telemann, while hugely successful then and now, is slight in ideas, often, and relies more than some peers simply on ranges of effects and figurations. Perhaps overdramatizing is warranted. But the movements marked in his Fantasy I in C Minor to alternate tenderness with briskness and speed, Martin conveyed with strikingly deep feeling. Immediately richer content, not only in harmony but in wit, was to be had from C.P.E Bach, to wit his Twelve Variations on “Folies d’Espagne.” Martin played the very old harmonized melody simply beautifully, so much so that the ending came as a disappointing surprise. The Fantasy in F-sharp Minor became wordless opera, a tutorial in mood creation informed by delicious dissonances and then cadences led into via fleet runs and arpeggios. The large audience remained rapt. The popular, playful Deuxième Sonate Prussienne in B Major “put the instrument in a good mood”, Martin said afterward, yet some of that resulted from her sensitive, graceful, indeed exquisitely perfect touch, abetting this Bach’s sly gestures clearly to salute Haydn. Ian Watson is among my very favorite local keyboardists, an energetic, articulate, poised, amusing showman (although that word does not really have the right connotations), a musician who knows his own mind, knows the history, and confidently pushes the music with high spirits. You never fret about rhythmic strength with him. Courtesy of the MFA’s large Wedgwood-encrusted 1796 Broadwood fortepiano, we turned on the big stereo to learn about the “London Connection”. This instrument features wonderfully buzzy-rumble bass, eloquent, potentially plangent midrange, and plinky treble. Haydn’s well-known Sonata in E-flat Major Hob. XVI:49 (for some reason the program listed Haydn’s last one, in that key also) came off as a little forward, wanting lightness maybe, at least initially. Here and elsewhere, I recalled that I have heard Watson play somewhat more cleanly (although in the Kreutzer read from his and Susan Ogata’s explosive new Beethoven Fortepiano-Violin Sonata set, he practically goes off the rails). Nonetheless, the Haydn Allegro’s pranking on 2-3-4-1, and sour flavors; the long Adagio’s sonorous walk through sorrows, observing them from different viewpoints, with a middle section of rich hand-crossing to build dramas forte or piano; and finally the Presto’s shape and thrust — all created an apprehensible order and a communicated logic. It was not the first time I have experienced this with Watson. The Sonata in D Major of J. C Bach (1735-1782; the 11th surviving child, youngest of the sons) received grand and jovial treatment, the result an utterly charming product. For the most part, Beethoven’s underplayed Sonata No. 12 (Op. 26) was extraordinarily well-done. Meaty, touching, more interesting than most early Beethoven (variations, funeral march, etc. ), it concludes with a natty Presto that here might have been over-rubatoed, and the drolly flat ending, a stealthy steal to home plate, may not have needed to be blurred to that degree. Watson’s show ended with Beethoven’s Five Variations on (Arne’s) Rule, Britannia, in rousing fashion complete with punctuation by the Broadwood’s middle thump pedal. And so almost 30 hours after beginning, we happily returned to the lithe digits of Benjamin Alard, stroking the impressive two-manual 1736 Hemsch harpsichord. Now eye-fetching as pastorally painted a century after construction, it sounds about as lovely as a harpsichord can, bathing everything in the most silvery of tones. Alard began his “Between Transcription, Dance, and Italianism” portion concluding the BEMF keyboard mini-festival off-program, with selections from François Couperin’s (1668-1733) didactic L’art de toucher le clavecin, in a ravishingly static, temporally fussed, hanging-in-space presentation that no one could possibly move to. 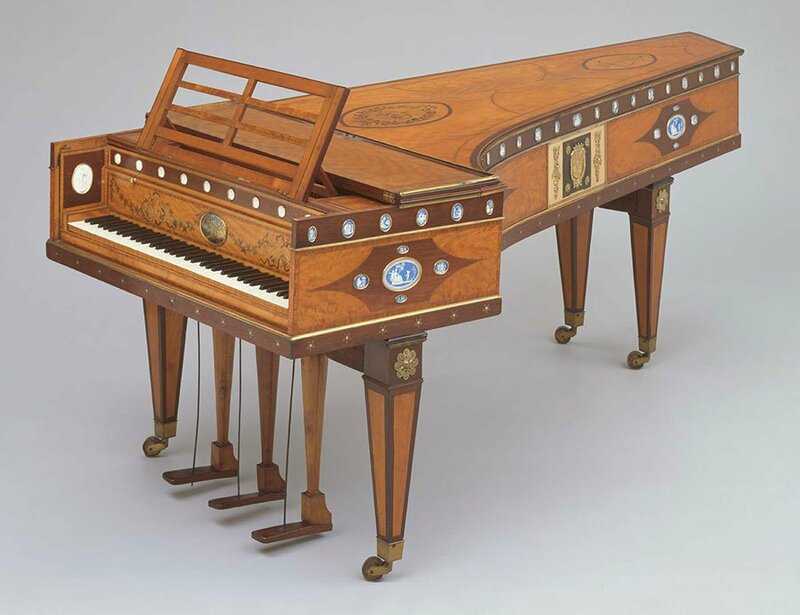 Bach’s Keyboard Workout’s French Overture (S.831), specifically for two-keyboard harpsichord, relocated the motor and was propelled all about B minor with considerable elegance. The half-dozen dances that Alard enlivened end with an unusual Echo movement, to display each manual. Alard again broke from published program with (I think I understood the helpful harpsichord student next to me correctly) the eight variations of the S.767 Chorale Partita, their dour mien a stern contrast to the Overture’s party. Elegance returned during the dashing Italian Concerto chestnut, also from the Keyboard Workout. So embellished that you could almost die, it also showed such superlative drive and finish that I was hoping for an encore. In addition, I wasn’t yet ready to leave the 1700s.